In the world of firearms, the Glock is renowned for its reliability and durability. Even so, for maintenance purposes, it is essential for you to know how to field strip your Glock pistol. The Glock pistol is disassembled by hand, with no tools needed. Remove the magazine by pushing its release button. The release button is located just behind the trigger on the stock. Pull the slide back to unload any ammunition that is in the chamber. With the slide back, double check inside the ejection port and make sure the chamber is empty. Do not proceed until you are sure the gun is unloaded. Pull the trigger while the pistol is pointed in a safe direction. This is necessary for removal of the slide. Curl your fingers around the top of the slide, with your thumb around the back of the gun grip. Squeezing your hand in this position will cause the slide to be pulled back a little bit. Squeeze so the slide is back approximately 1/2 inch. 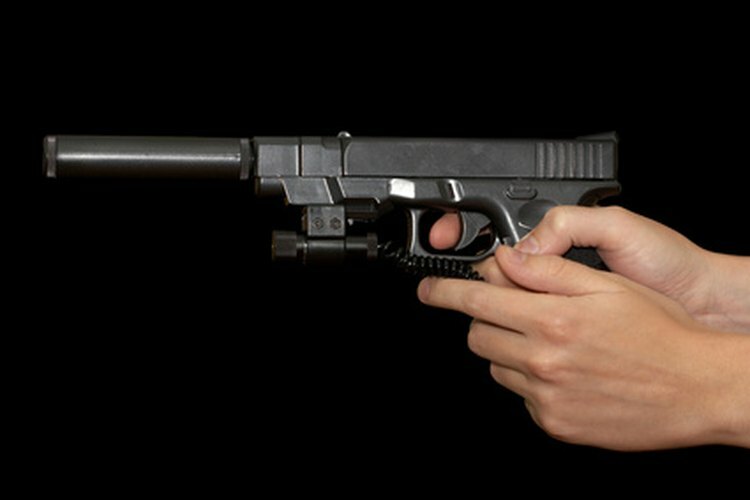 Use your opposite hand to pull down on the slide release switch, which is in the middle of the pistol and needs to be pulled down on both sides at the same time. With the slide release switch pulled down, release the slide and push it forward off of the stock of the gun. Remove the spring and barrel from the slide. The spring is on the underside of the slide and holds the barrel in. Compress the spring slightly to remove it. Slide the barrel out toward the back of the slide. Ken Parelius has been writing professionally since 2009. He enjoys teaching, which inspires him to write instructional articles for various websites. He is also a freelance copywriter who creates website content for local businesses. He attended McHenry County College for business management.